Defrag, backup and repair your hard drive. Is there a better alternative to DiskTools Pro? Is DiskTools Pro really the best app in System category? Will DiskTools Pro work good on macOS 10.13.4? Note: while the app still downloads, the developer's website does not load anymore and the app is no longer under development. DiskTools Pro makes Mac repair and maintenance painless, fast and easy. DiskTools Pro is the only utility software that allows you to schedule when to defragment, backup or repair bad sectors of your Mac. It also does not require you to run the tools from a boot DVD, CD or separate volumes in order to fix the startup volume. 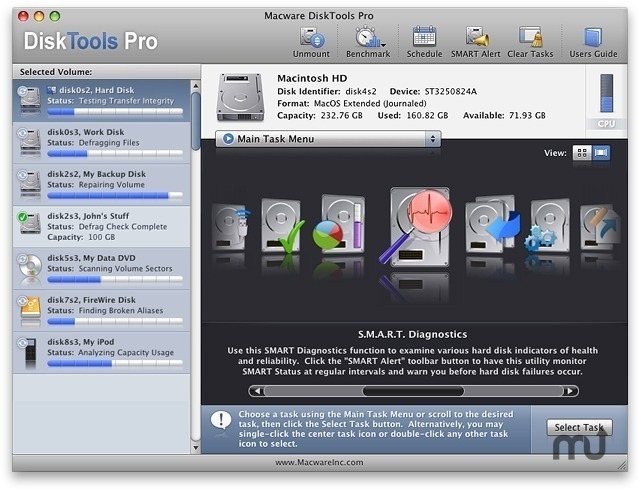 Use DiskTools Pro to defragment, repair volumes, scan and repair bad sectors, create bootable backups, monitor S.M.A.R.T. status, benchmark your Mac, test disk integrity, analyze drive capacity to free space on your Mac, and more.